Tadeusz Makowski (21 January 1882 - 1 November 1932) was a prominent Polish painter active in France for most of his life. He was born in Oświęcim. Makowski attended the Academy of Fine Arts in Kraków. He studied under Jan Stanisławski and Józef Mehoffer. In 1909, he departed for Paris. Makowski started off as a landscape painter but then shifted towards Post-Impressionism and Cubism. However, he is arguably most famous for his rural landscape paintings. He met Pablo Picasso,who was his good friend. He drew in wonderful styles. Kids got booklets to find paintings and put stickers on blurred images. Andrzej Wróblewski (1927 - 1957) was a Polish painter who died in a tragic mountaineering accident in 1957 when he was only 30. He is recognized by many as one of Poland's most prominent artists in the early post World War II era, creating an individualistic approach to figurative painting. Kościuszko at Racławice Battle, borrowed from Krakow. The victorious battle was fought against Russians in 18 century. Oh my, I am a real maniac. There are 60 more photos but I have to finish now. Barbara Piasecka Johnson (born as Barbara Piasecka on February 25, 1937 in Poland) is a humanitarian, philanthropist, art connoisseur and collector and widow of J. Seward Johnson, Sr..
Barbara Piasecka Johnson has been a major benefactor to a number of charitable projects, especially in her native Poland. 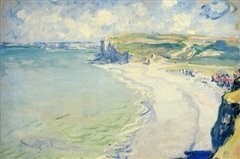 Claude Monet’s Beach at Pourville recovered this week by Polish police has been returned to the National Museum in Poznan, western Poland. The work of the French impressionist was stolen from the Museum nine years ago. It was recovered in Olkusz , southern Poland. A 41 year old man suspected of the robbery was arrested. For two days the painting, worth over one million dollars - has been thoroughly examined in police laboratories before being returned to the Poznan collection. The work is slightly damaged. The thief cut it out from the frame when stealing it - and replaced it with a fake - and its edges are torn. The painting will go on public display in June after museums conservationists repair the damages and a special exhibition is prepared. The Poznan National Museum is exhibiting Claude Monet’s Beach of Pourville following the canvas was recovered this year after being stolen from the museum in 2000. The painting has had to undergo thorough renovation after being cut from its frame by Robert Z. (surname withheld due to Poland’s privacy law), who told a court in July he stole the painting “because he loved it”. Wojciech Suchocki, director of the Poznan National Museum says the painting remains priceless, even after extensive renovation. “It is not only the only Monet in a Polish collection. It’s also the only Monet which was ever stolen,” he told Polish Radio. The canvass was cut out from it’s frame and hidden by the thief in a cupboard at his parent’s house. Authorities had all but given up hope of finding the work until a policeman from Poznan, analyzing fingerprints from a completely different investigation found that they matched those taken from the frame of the stolen painting. Several days later Robert Z. was behind bars and the canvass safe in the hands of Museum specialists.